The research center is good accesible by public transport, car or a cab. It is laying just outside the busy city center of Chengdu. A cab drive takes about 35 minutes. 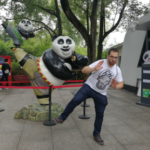 Check here for other options if you are not coming from Chengdu. The opening hours are from 7:30 AM until 18:00 PM the whole year around. You can simply purchase a ticket at the ticket booth located next to the entrance for 58 RMB per person. There are also options for guided tours if you desire, but in our opinion it is not really necessary there the research center provides a lot of information on its on in English. 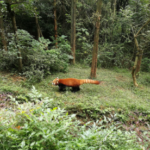 It is preferred to visit the park before 10:00 AM there the Panda bears are mostly active during the morning when they eat. We arrived a bit later around 12:00 PM but were fortunate to see a lot of active Panda’s on the sight. 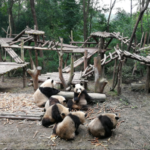 Make sure you be there before 14:00 PM, else you might be stumbeling upon a lot of empty or inactive Panda resorts. 2 to 3 hours is enough to visit the facility and get the most out of your day. it is a great way to combine your visit with a trip to the famous Giant Buddha of Leshan (read about it on my previous blog). 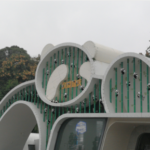 There are numerous interactive sights which teach you all the ins and outs of the Panda bear. It is a research center after all! 😉 The Chinese government is trying to make visitors aware of the endangered situation the Panda bears are in . By promoting public awareness the government hopes to help save the species from becoming extinct. The research center is divided in different sections. The adult Panda bears are the least active during the day and really need to be visited early in the morning. 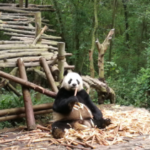 If you are lucky enough you might see some eating bamboo, chewing and not caring about all the people taking their pictures! 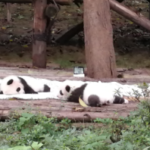 There are also baby Panda cubs to see, but they are not very active and only crawl a bit. 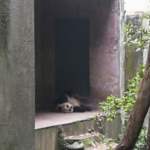 The most fun part are the adolescent Panda bears who have a lot of energy! They play around the whole time. Seeing them brawl with their siblings or mother, rolling down the grass hills of their resort and being adventurous to their surroundings. You can gaze at them for hours seeing them having fun, so cute! As you can see on my Instagram movie, they love to play around! Every enclosure has detailed information about the Panda bears who are its inhabitants. Here you can read its age, gender, name and characteristics in English, Chinese or Japanse. Do not underestimate the little Red brother of the Giant Panda! Go to their resort and try to spot them in the trees, moving around like huge squirrels throughout their territories. The whole research center is also filled with Panda props, with the famous Kung Fu Panda movie character being everywhere. Be sure to take a cool picture! 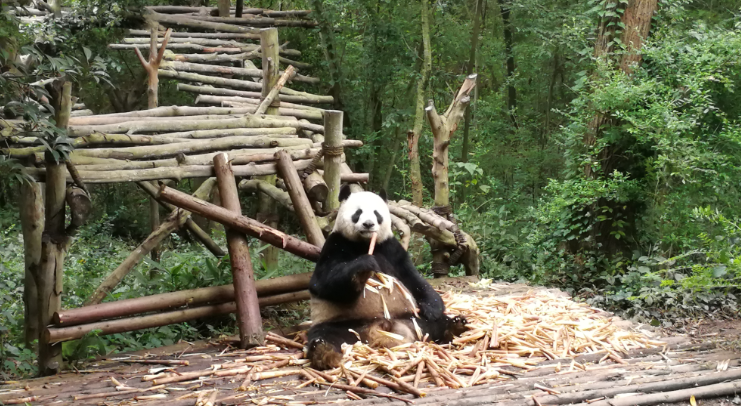 🙂 And of course everything is surrounded by bamboo, the Panda’s favorite treat! We really enjoyed our visit to the research facility. It gave us a lot of insight information about these beautiful animals and to see them upclose is a special thing to witness. 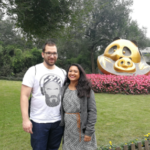 Be sure to squeeze in a visit to the research center while visiting China, it is worth every minute!